Robin and Flo digging at Shaw Nature Reserve. 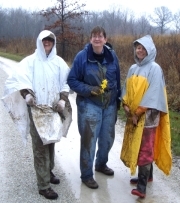 Lynn, Beth, and Debra (The Mud Girls) at Shaw Nature Reserve. The Mud Girls and Jason pulling their haul of Daffs at Shaw Nature Reserve.